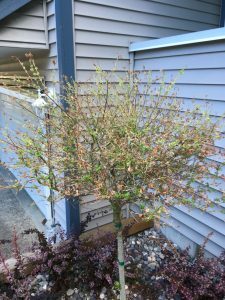 Landscaping and Property Maintenance - Japanese willow response to drought - Proper Landscaping Inc.
Every time I install new plants on a site I worry about them because I want them to get established and thrive in their new landscape. Usually I won’t see the plants for months but in the case of two Japanese willows (Salix integra) I planted it was different. 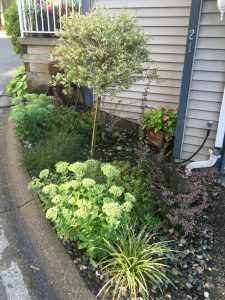 After my company schedule was re-done in spring, I kept coming back to the same site so I could observe my newly installed plants, including the two willows. Everything looked fine until summer heat arrived. That’s when I noticed browning in the leaf tips. That’s called necrosis or tissue death as the plant is unable to draw up enough water into the crown. So I immediately did my own weekly watering with a hose that’s literally right next to the bed. Also note the growth at the bottom of the stem. Sadly, this is very common on strata (multi-family) complexes. People are very busy and when they water, they do it badly. Guaranteed, the owners sprinkle the plants for a few minutes and go back inside. 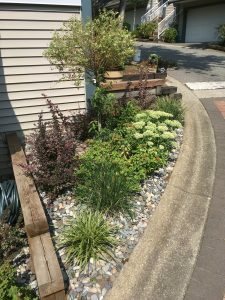 Proper watering requires a gentle soak that lasts for several minutes. I watered in the morning and then again before exiting the property. Now observe the same plant weeks later. The top is recovering but the stem has significant growth along the stem. This is another classic response to lack of water. Since the top isn’t getting enough water, the plant starts to bonsai itself by pushing out new growth along the stem. I’m leaving it on for now to protect the bark but by fall I will prune it all off. Note the growth along the stem. For comparison, examine the other Japanese willow (below) planted at the opposite corner. The owners water better and it gets a little bit more shade. I noticed some browning in the leaves but it wasn’t severe enough for the plant to attempt a bonsai move. The stem is clear of any new growth. 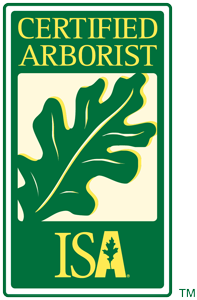 Summer heat conditions are harsh for landscape plants so owners need to water properly. 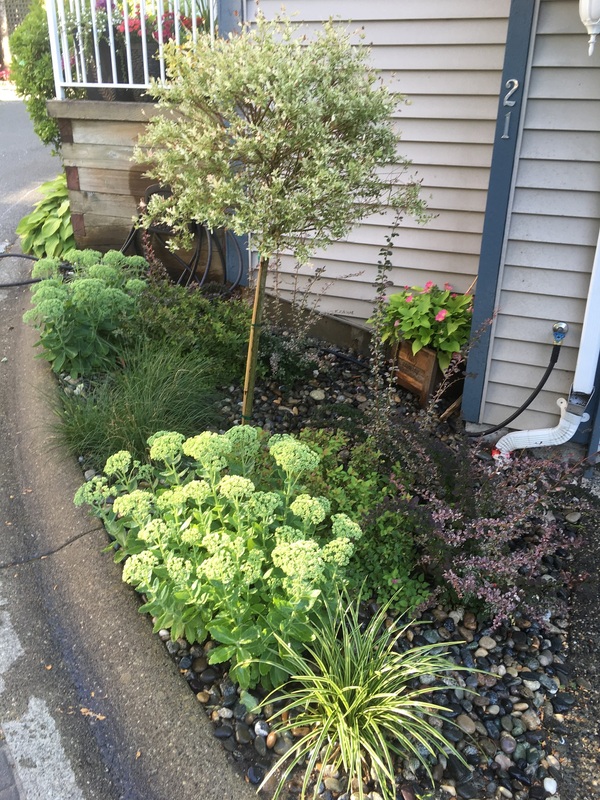 And when there are newly installed plants, watering is an even more pressing issue because water allows roots to develop. So check on your plants and don’t forget to water them.